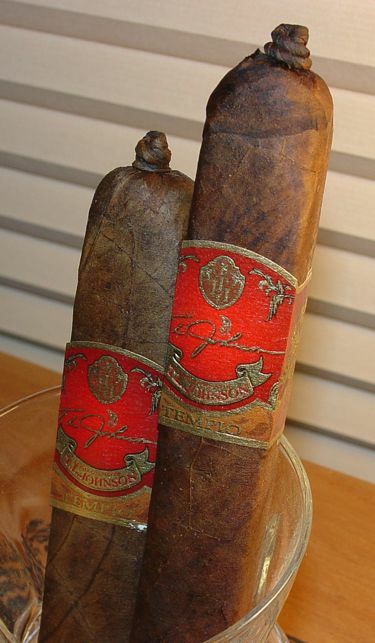 I hadn’t heard of T. L. Johnson Cigars before, but I have heard of one of their brands — Jose Dominguez. 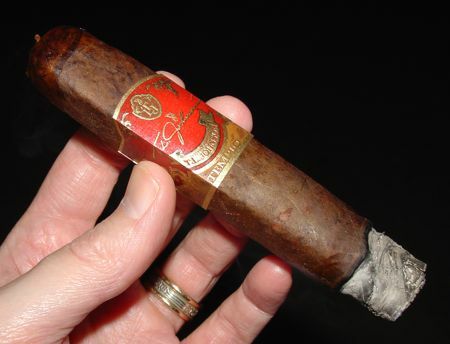 In addition to this one, Johnson produces Palma cigars as well as three distinct lines under the T. L. Johnson brand name: the Legend Reserve Reserve 63, and the Signature line in Connecticut and Maduro. The company is located in Colorado, and it looks like their cigars are distributed primarily in-state. Tempio is, I believe, their newest line, and since it is produced by one of my favorite boutique manufacturers — La Tradicion Cubana — I was itching to give it a go. If it weren’t for the sloping shoulders and tightly wound pig-tail cap of the Tempio, I’d say this cigar looks like a carpenter’s pencil. A big one. Maybe the right size for Shaq if he adds cabinetry to his career profile. The corners are clean and form tight right angles that relax a little as the cigar burns. The colorado maduro wrapper is smooth but leathery in appearance. The veins appear to have been pressed into the leaf, so it looks rustic but doesn’t feel that way to the touch. The draw offers the right amount of resistance, and the burn is surprisingly even for a square pressed stick. The ash is a little bit flaky on the perimeter but holds strong. The Tempio focuses on a cedar flavor throughout the smoke, but it starts up with some unusual scents that are hard to place. There is a peppery spiciness on the tongue that fades pretty quickly, but the most interesting aspect of the first third are the fleeting sweet spicy notes in the aroma. There seems to be something vaguely fruity about the aroma, but not in a light way — it’s a spicy fruitiness that reminds me a little of the scent of mulled wine. The spice loses some of that interesting sweetness in the mid-section, but it remains sweet in a more conventional way. There is less of a cedar flavor and the smoke becomes a little smoother. The smoke is medium in body, and probably a touch heavier than that in strength. There is a dry papery tartness in the aftertaste. The last third reintroduces the pepperiness as the flavors begin to char, but even in the last few puffs some sweetness lingers. I love the complexity of flavors that the Pennsylvania wrapper contributes to the Tempio, and the overall performance of the cigar is very good as well. It’s a balanced with just the right amount of spice, and it’s never boring. In fact it’s a little bit edgy, which I think gives it some aging potential. The MSRP on this cigar is about as bold as its flavors — around $11.00. I’d like to see that price drop a bit, but there’s no arguing with the quality of the stick. The biggest challenge will be locating a Tempio for purchase. It looks like there is at least one online vendor, or if you are lucky enough to live in Colorado, check out the T. L. Johnson website for retail locations. I love how some major manufacturers label a cigar “boutique” and yet they’re available everywhere. Tempio really is a boutique blend — small production, sparse distribution, and on the expensive side. I hope it gets wider distribution at some point.